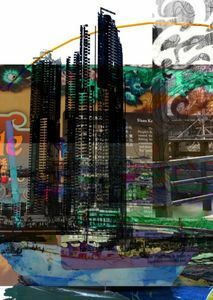 Zoran Poposki's work "Hong Kong Atlas" has been selected as a Winner in the 4th 2012 Showcase competition, in the Mixed-media category. The ArtSlant Prize is a Showcase Series designed to exhibit and promote talented artists from around the world. Showcase Winners have been designated as promising artists by Artslant's team of professional art watchers. Poposki's "Hong Kong Atlas" is part of a series of urban landscapes of Hong Kong inspired by Kai-cheung Dung's novel "Atlas: The Archaeology of an Imaginary City".